At the end of December 2014, there were at least 55 political prisoners in Papuan jails. Six Papuans were killed and at least 22 others suffered injuries as a result of indiscriminate shootings by military and police officers on 8 December 2014 in Enarotali district in Paniai regency. Security forces fired into a crowd of around 800 peaceful demonstrators who were performing a traditional Papuan waita dance in protest of the torture of a 13-year-old boy by Special Military Team Unit Batallion 753 (Oknum Tim Khusus Batalyon 753, Timsus 753) officers the previous day. Timsus 753 military officers were also responsible of the documented torture of two Papuans in May 2010. This brutal treatment of children by State security forces in open and public spaces is particularly alarming and sums up the entrenched culture of impunity in Papua. While President Joko Widodo stated that a fact-finding team would be formed, it remains to be seen if it would be a joint inquiry consisting of the army, police, the National Commission of Human Rights (Komisi Nasional Hak Asasi Manusia, Komnas HAM), and traditional Papuan leaders, in accordance with the recommendations of Komnas HAM. The importance of such a joint inquiry would be to ensure that military personnel responsible could be questioned and therefore held to account. Political and human rights analysts have speculated that the 8 December shootings may have been fuelled by an emboldened military following the announcement of Jokowi’s support for a new regional military command (Komando Daerah Militer, Kodam) in Papua. Long-standing violations by the Indonesian military in Papua, perpetuated by a culture of impunity, suggest that such plans are incompatible with Jokowi’s earlier pledges of protecting human rights in Papua. On 27 December, tens of demonstrators in Jayapura were arrested for protesting the planned visit of President Jokowi. The demonstrators, along with other Papuan civil society groups, rejected Jokowi’s visit in response to Bloody Paniai. In a separate case in Puncak Illaga in Mimika regency this month, at least 26 Papuans were arrested and ill-treated, some of whom were tortured. This case echo three other cases reported in 2014: the Nimbokrang arrests in August, the Sasawa arrests in February and Bloody Yotefa in July. In these cases, security forces continue to target ordinary Papuan civilians with excessive use of force and indiscriminate arrests in a bid to collectively punish indigenous Papuan communities for violent acts committed by other criminal individuals and groups. Such violent reprisal attacks highlight the lack of basic protection afforded to indigenous Papuans against atrocities committed by Indonesian state security forces. One of the detainees in the Pisugi Elections Boycott case, Yosep Siep, has been hospitalized due to pains endured as a result of torture faced on arrest. Court hearings for the five Pisugi detainees have been repeatedly postponed due to the difficulty of obtaining witness testimonies in court. 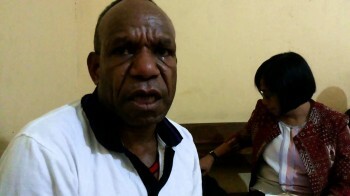 In Nabire, ten West Papua National Committee (Komite Nasional Papus Barat, KNPB) members were released after more than a month in detention, reportedly due to the lack of evidence to bring them to trial. Papuan news source Suara Papua reported that on 27 December 2014, tens of demonstrators were arrested by security forces for participating in a long march protesting the visit of Indonesian President Joko Widodo to Papua. According to a testimony from one witness, the demonstrators were dressed in indigenous dress and intended to march from Sosial Street in Sentani to Sentani Airport. On the march, they were stopped by Military Infantry Batallion 751 and were reportedly arrested by both military and police officers. They were then detained in Jayapura Regional police station. It is not yet clear exactly how many demonstrators were arrested and if they currently remain in detention. Information received by independent local human rights workers reported the arrests of at least 26 Papuans in Illaga in Puncak Jaya, Mimika regency following the fatal shootings of two Mobile Brigade (Brigades Mobil, Brimob) officers by the pro-independence armed movement the West Papua National Liberation Army (Tentera Pembebasan Nasional Papua Barat, TPNPB). On 3 December 2014, two Brimob officers were shot in front of the offices of the Papuan Legislative Council (DPRD, Dewan Perwakilan Rakyat Papua) in Kago district, Mimika. TPNPB members also took their assault rifles. TPNPB has released a statement claiming responsibility for the attack. Shortly afterwards, a joint military and police task force responded by conducting a search operation in the area, burning down 15 homes belonging to local villagers, who were reportedly not involved in the attack. The homes that were burned down include 13 traditional honai houses and the home of Kwarnus Murib, the local district head. 24 people were arrested and allegedly faced ill-treatment and torture on arrest. One of the detainees, Pai Murib, was released in a critical condition following heavy beatings to his stomach. Murib was sent to the public hospital in Puncak Jaya following his release, and was only able to speak and eat after two days. According to Murib’s testimony, on 3 December he was out collecting wood in the forest to use at home when police, without questioning him, proceeded to severely beat and then detain him. The 23 other people who were arrested are Baitem Murib, Rekules Murib, Patung Kulua, Munius Tabuni, Pliton Murib, Wisisi Murib, Elison Murib, Yomis Murib, Ketamius Telenggen, Daud Murib, Penggeri Murib, Tipen Tabuni, Kitenius Murib, Matius Murib, Malukni Murib, Delpi Kulua, Agus Magai, Isak Tabuni, Manus Waker, Yonar Telenggen, Donar Telenggen and Yuh Mom. According to human rights investigators, the 23 men were not involved in the attack against the two Brimob officers. They are currently detained in Puncak Ilaga Regional police station. On 5 December, Mernus Murib and Tomas Tabuni (a member of the Regional People’s Representative Council (Dewan Perwakilan Rakyat Daerah, DPRD) of Puncak Ilaga) were arrested outside Bank Papua in Puncak Ilaga and detained in Puncak Ilaga Regional police station. They were reportedly arrested in relation to the attack on the two Brimob officers. It is unclear what involvement, if any, the two men have in the attack. Human rights investigators reported concerns for the welfare of the 25 detainees, stating that they may be at risk of torture. The detainees are currently without legal representation. On 23 December, ten KNPB activists from Nabire and Dogiyai who were arrested on 19 November, were released. Sadrak Kudiai, the head of KNPB Nabire, Agus Tebay, Derius Goo, Yafet Keiya, Hans Edoway and Aleks Pigai from Nabire, and David Pigai, the head of KNPB Dogiyai, Enesa Anouw, Marsel Saul Edowai and Agus Waine from Dogiyai, were previously charged with incitement and treason under Articles 160, 106 and 55 of the Indonesian Criminal code. They were arrested for taking part in commemorative activities celebrating the 6th anniversary of the formation of the KNPB. Majalah Selangkah reported that the Head of Nabire Regional Police, H.R. Situmeang stated that the ten members were ‘gifted’ a Chrismas release following appeals from the local tribal leader and villagers. One of the detainees, Sadrak Kudiai, challenged Situmeang’s statement, asserting instead that they were released because police could not find evidence to detain them further. One of the detainees of the Pisugi Elections Boycott case, Yosep Siep, has been hospitalised for chest and ear pains endured as a result of torture he faced on arrest. According to defence lawyers, Siep also seemed to be unable to concentrate when answering questions and is under tremendous stress. He is also reportedly suffering from typhoid. Siep previously received medical treatment but was still made to attend hearings despite his poor condition. However, defence lawyers appealed for Siep to receive intensive treatment in hospital until he is fully recovered. His court hearing has since been postponed until he is fully recovered. Court hearings have also been postponed for the four other detainees – Ibrahim Marian, Marsel Marian, Yance Walilo and Yosasam Serabut – as witnesses did not show to testify. Court hearings scheduled for 3 and 10 December were postponed when witnesses who were called forward to present their testimonies failed to attend the hearings. Witnesses who were called forward included members of the public and police officers. According the Public Prosecutor, the members of the public were no longer living in the area and thus not able to attend, and the police witnesses were too preoccupied with policing activities to be able to attend. On 8 December 2014, five Papuans were fatally shot by military and police officers and at least 22 others suffered injuries in Enarotali district in Paniai regency. A sixth victim died in hospital the following day. Security forces began indiscriminately shooting into a crowd of Papuans who were performing a traditional indigenous dance in protest of the torture and ill-treatment of three boys by military officers the previous day. According to reports from local human rights investigators and Papuan media, on the evening of 7 December, at around 20:20 Papua time, three boys aged 12 to 13 stopped a vehicle in Enarotali and urged its occupants to turn on their headlights for safety reasons as it was dark. At 21:00, the same vehicle accompanied by a military vehicle belonging to Special Military Team Unit Batallion 753 (Oknum Tim Khusus Batalyon 753, Timsus 753) arrived back to the same spot to seek out the three boys. Timsus 753 military officers severely beat Yulianus Yeimo, one of the three boys, with rifle butts and slashed him on the head and body, as documented in a report by the Peace and Justice Department of the Papuan Gospel Tabernacle Church (Departemen Keadilan dan Perdamaian Sinode Gereja Kemah Injil (KINGMI) di Tanah Papua). Yeimo eventually managed to escape and ran away with the two other boys. The military officers chased the three boys and fired shots in their direction. As a result, one of the boys, Jeri Gobai, reportedly suffered a gunshot wound on his right shoulder. The following day, on 8 December, at around 07:00, the Head of Paniai Regional police arrived to the location where Yeimo was tortured. Local villagers assumed they were responsible for the torture and ill-treatment of the three boys, as the vehicle they used was similar to the one used the previous night, and started throwing stones at the police. After an intervention from the local regent, tension eased and the crowd stopped their actions. At around 09:00, a crowd of around 800 Papuans gathered at Karel Bonay field in front of Enarotali district police station and the Military Command (Komando Rayon Militer, Koramil) to demand an explanation for the events of the previous night. The demonstrators performed a traditional Papuan waita dance, in expression of their grievance. Military and police officers responded by indiscriminately shooting live ammunition into the crowd. Paniai-based human rights investigators and news reports stated that five people died on the spot; Alpius Youw, Yulian Yeimo and Alpius Gobai (all 17-year-old high school students) and Simon Degei (an 18-year-old high school student). Abia Gobay (a 17-year-old high school student) also died from gunshot wounds, but his body was found 400 metres from Karel Bonay field. Reports indicate that his family brought his body back to the family home. The following day, on 9 December, Yulian Tobai, a 40-year-old security guard died of his injuries in hospital, making him the sixth victim of the police and military shootings. A report by Jayapura-based church organisation the Fellowship of Baptist Churches of Papua (Persekutuan Gereja-Gereja Baptis Papua) stated that at least 22 other people suffered gunshot-related injuries. The youngest amongst those that suffered injuries was 8-year-old Benny Yogi, an elementary-school student who was shot in his hand. On 11 December, Major General Fuad Basya, the Head of the Information Centre for the Indonesian National Army (Tentera Nasional Indonesia, TNI) told Indonesian media of the possibility of separatist involvement in the 8 December shootings. General Gatot Nurmantyo, the Army Chief of Staff, claimed that the shootings were initiated by the Free Papua Movement (Organisasi Papua Merdeka, OPM) from the surrounding mountains. Dr. Otto Nur Abdullah, who heads the National Human Rights Commission (Komisi Nasional Hak Asasi Manusia, Komnas HAM) team investigating the 8 December shootings, stated that this was impossible given that the mountains were far away. He asserted instead that military officers from Timsus 753 were responsible for the shootings. On 15 December, Tedjo Edhy Purdijatno, the Coordinating Minister for Politics, Law and Security (Menteri Koordinator Politik, Hukum dan Keamanan, Menko Polhukam) told Indonesian media outlets that while investigations into the incident are ongoing, the local Papuan community had come to a deal with the military and police in line with customary ways (secara adat), by performing a customary ritual of bakar batu. Local church and community leaders condemned the announcement stating that no such agreement had been made and that it only served to further anger the families of the victims. The Head of the Papuan Customary Council (Dewan Adat Papua, DAP) in Paniai, Jhon Gobay, told Majalah Selangkah that such a statement represented a systematic effort by the Indonesian State to conceal the situation and to abscond responsibility for the 8 December shootings. Komnas HAM has called on the Indonesian government to conduct a joint fact-finding inquiry consisting of the army, police, Komnas HAM and traditional Papuan leaders. Human Rights Watch Indonesia and Imparsial have similarly implored the Indonesian government to conduct a joint inquiry, to ensure that investigators can question military personnel who were present during the incident. Human Rights Watch have also called on the Indonesian government to protect witnesses present during the 8 December shootings, noting that a preliminary report by Komnas HAM showed that witnesses were “unwilling to testify” due to concerns of reprisals. A Suara Papua article reported that the local community were severely traumatised by the shootings and that a heavy presence of armed members from the security forces could still be found in Enarotali almost a week after the shootings. An article on the Democracy Alliance for Papua (Aliansi Demokrasi untuk Papua, AlDP) website reported that Komnas HAM will begin to pay more attention to monitoring treason cases in Papua. Dr. Otto Nur Abdullah, who leads the Komnas HAM team investigating Bloody Paniai, noted that they plan to monitor the full trial process of cases involving treason charges. Komnas HAM also plans to conduct plenary sessions examining past cases, including the murder of Papuan leader Theys Eluay, the disappearance of Eluay’s personal driver, Aristoteles Masoka, and the disappearance of 17 speedboat passengers in Serui in March 2009. Dr. Abdullah also stated the possibility of reopening the Theys Eluay case to reach a verdict regarding his abduction.